Biocare’s Glucosamine Hydrochloride provides 750mg of glucosamine as hydrochloride per tablet, along with vitamin C and magnesium. Added vitamin C ensures a contribution to the normal collagen formation for the normal function of bone and cartilage. SKU: BIO29360. Categories: Glucosamine, Top Ten. Tried and tested for WADA (World Anti-Doping Agency) banned substances to ensure that they are safe for professional sports persons to use Vitamin C contributes to the normal collagen formation for the normal function of bones, skin, teeth, cartilage and blood vessels Vitamin C contributes to maintain the normal function of the immune system during and after intense physical exerciseForms an important substrate in the connective tissues lining the intestinal tract and musculoskeletal system. 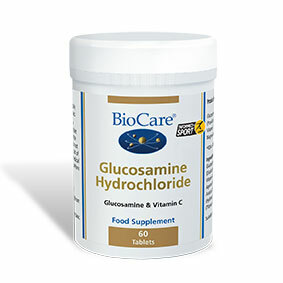 BioCare’s Glucosamine Sulphate supplement also contains a buffered form of Vitamin C for collagen and tissue repair. Glucosamine hydrochloride 800mg Magnesium ascorbate (providing vitamin C 188mg & magnesium 12mg )200mg Cellulose & vegetable magnesium stearate (non-active ingredients). 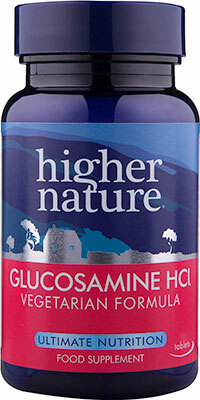 Glucosamine now sourced from vegetable origin so this product is suitable for vegetarians and vegans. Caution is advised in diabetes. 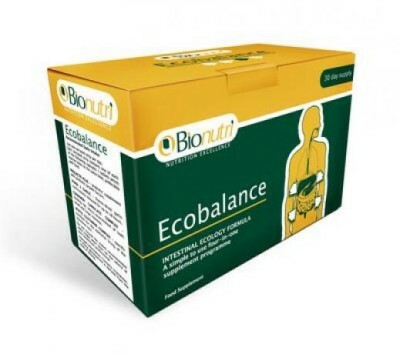 This product contains Glucosamine derived from shellfish and may not be suitable for some vegetarians or those who have a specific shellfish allergy.